Liz Craft and Sarah Fain posed that question on a recent-ish episode of their podcast, Happier in Hollywood (#73). They were identifying the differences between their “nemeses” and their “professional crushes,” people in their Hollywood circle who either irritated them because they succeeded by taking actions that Sarah and Liz found distasteful or who they wanted to emulate. 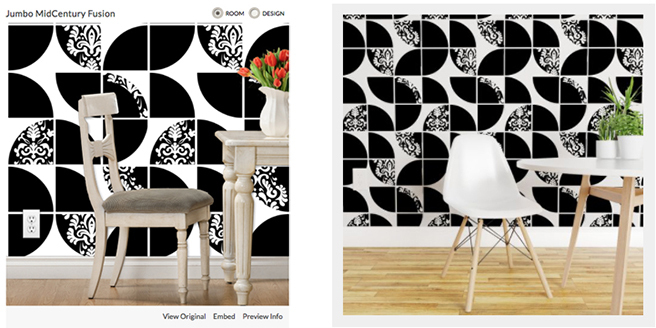 I was surprised at how quickly I could pinpoint designers from the Spoonflower Community who fit those profiles. My nemesis shall remain nameless, but my crush is a gal who calls herself, “ottomanbrim,” a.k.a. Tina Vey. Secondly, she’s a very kind person—friendly, approachable, and supportive of others’ efforts. And thirdly, her designs make me swoon! Every single one of them. She has a mid-century modern vibe with this cool, linocut flair. Her patterns are hard-edged, but playful. She achieves what I strive to create—designs that are elegant and fun. She enters a lot of challenges and manages to maintain her style while adhering to the letter and spirit of the competition theme. Her style is so well developed and distinct that I can recognize her work in a crowd. 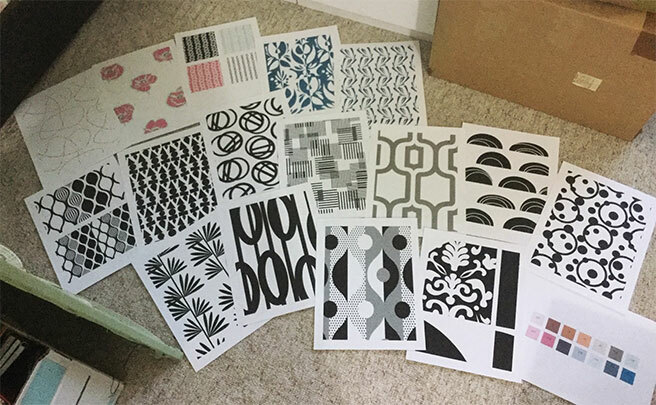 A sampling of ottomanbrim’s adoration-worthy designs from her Spoonflower shop. Part of the reason that I abandoned the Spoonflower Challenge Play-to-Pay strategy was that my efforts were resulting in a disjointed collection of designs. Lots of one-off pieces. Since I was gearing each one toward a predetermined theme, I was taking myself down tangential, dead-end paths. They were fun exercises, but they didn’t really get me anywhere. Tina, on the other hand, has managed to avoid those dead ends somehow. 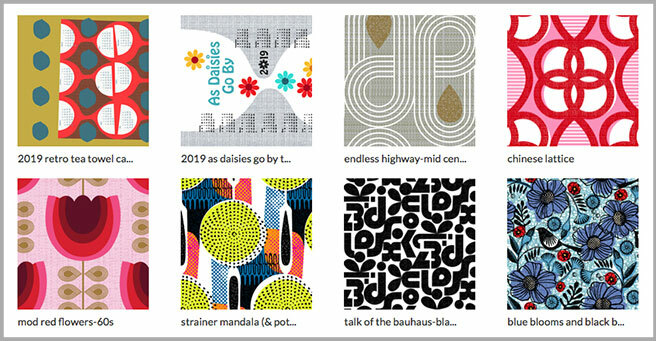 She has over 300 designs in her Spoonflower shop, many of which are challenge entries, and they all seem to work together. Even in their variety, it’s one, huge, cohesive collection, which seems like a very good goal to shoot for. 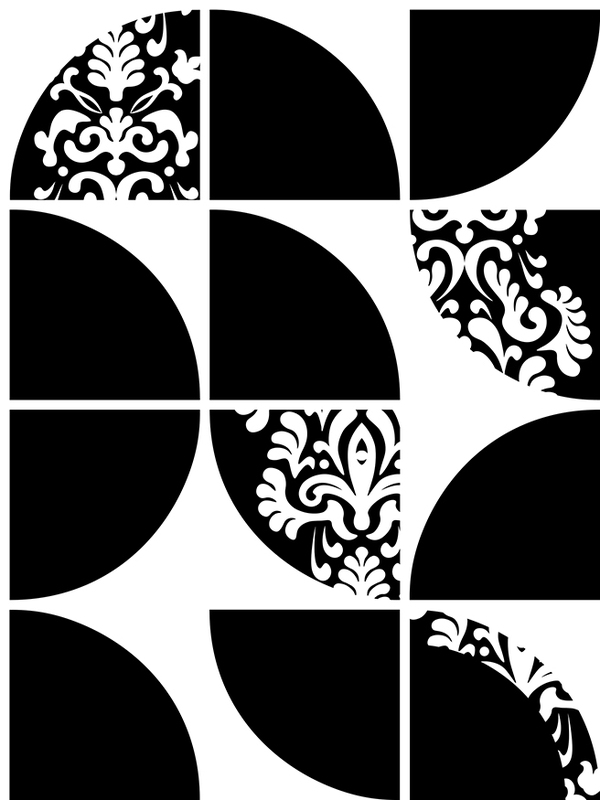 So, with that in mind, I’ve been working on a group of two-color designs that stem from my Black & White Wallpaper challenge entry. 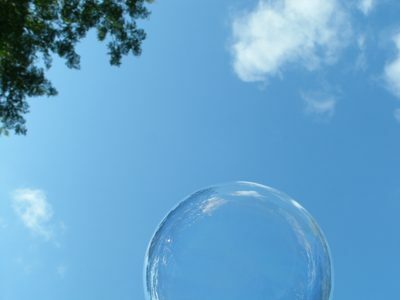 One color is always white, which, I hope, will be the hook that unites them. I’m going for whimsical, clean, and graphic. Laying out prints of the new designs to see how they work and play together. I shot for 30 designs initially because Spoonflower will let you sample in bulk for about a $1 a piece (versus $5, if you do them singly), but what I thought I could do in one month has taken three. I’m so excited about the results, though, I’m pooping pink daisies! I have a palette in mind, but I think I’ll upload all of them in black and white, too. You can never go wrong with black and white!